Like many other industrial manufacturers, PACCAR's stock rode the rise of Donald Trump. Is the market ahead of itself? Maybe so. While the bulk of the gains for the year were the result of Mr. Market realizing that PACCAR had fallen into value territory, the November jump isn't unique to PACCAR: Nearly every cyclical industrial manufacturer saw big gains this past month, including PACCAR competitor Navistar International Corp (NYSE:NAV) and heavy-equipment maker Caterpillar Inc (NYSE:CAT). The common thread? The election of Donald Trump as president of the United States. 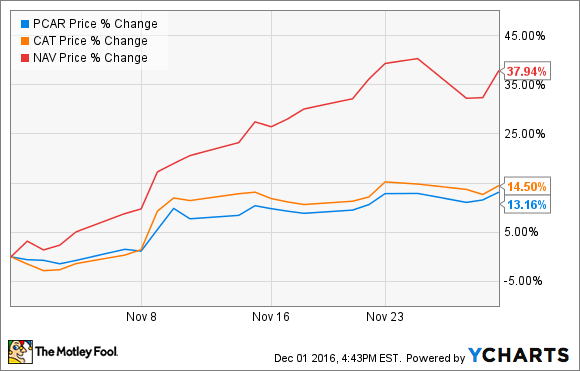 As you can see in the chart above, shares of all three of these companies jumped sharply on Nov. 8, and held relatively steady momentum throughout the month. So what's the thesis? In short, that lower corporate taxes, an increase in infrastructure spending, and reduced regulations would all benefit the bottom line of these companies -- particularly as it relates to their U.S. operations. I've never been one to invest based on changes in the political climate, though it does seem likely that a Trump administration, paired with Republican majorities in both houses of the legislative branch, will likely mean a reduction in the corporate tax rate. And that would be a good thing for PACCAR, as well as Caterpillar and Navistar. But at the same time, these companies are growing more and more international, and the impact of a heavy-handed Trump foreign policy can't be ignored -- particularly with regards to Europe, a hugely important market to these companies. For both PACCAR and Navistar, the truck market for 2017 is largely already set, with the majority of truck-buying customers already having their budgets in place well in advance, so it's very unlikely that truck sales in 2017 will be propped up by anything a Trump administration does. At best, it would be 2018 before these companies saw any measurable boost in orders. Infrastructure spending could be a boost for these companies. But not overnight. Image source: Getty Images. 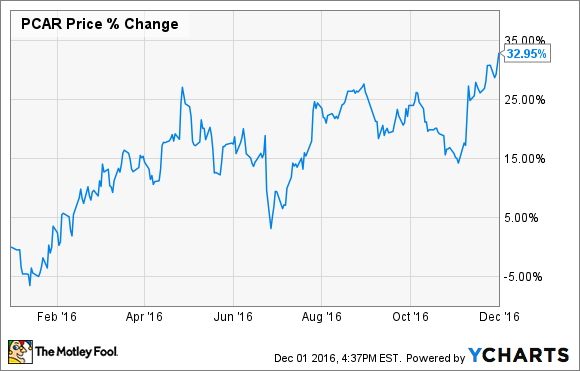 As to Caterpillar, management made it pretty clear that it wants investors to keep expectations low heading into 2017. The company is expecting sales to continue falling, driving profits down further as well, as global commodity markets remain weak and weigh on demand for the company's equipment. Lastly, PACCAR isn't the steal that it was earlier in 2016, having regained nearly all of its share-price losses since peaking in late 2015, and it's not particularly cheap anymore, trading at a price-to-earnings ratio of around 16 for full-year 2016 adjusted earnings. Don't get me wrong -- that's certainly cheap compared to the S&P 500, which is trading at a P/E of 25 right now, but it's relatively close to fair value for PACCAR, if maybe a little cheaper than it's been in recent years. Bottom line: The recent run-up following the election is great if you're a PACCAR shareholder, but the catalysts behind the run-up may not necessarily lead to earnings growth for the company, or for Caterpillar and Navistar -- at least in the next year or so. But as far as PACCAR goes, it's fairly valued if not a steal today, and a great company to own for the long term.